Our house has a lot of windows that are just begging for some art work. We made some sun catchers out of construction paper and hung them in the windows. They work well in a window that gets a lot of sunlight shining in! You will need construction paper or card stock paper, a piece of cardboard, push pin, and a piece of string or thread. 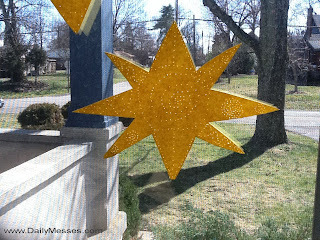 Cut out a star/sun shape out of the card stock. Place the shape on the piece of cardboard and use the pushpin to create a pattern (swirls, lines, etc.). Attach a piece of string to the top of a star point, and hang!